5 Y.M. Ko et al. / Current Photovoltaic Research 3(1) (2015) 31 를 띠는 S 사이의 정전기적 인력에 의한 박막 표면에서의 반응 기회 증가에 의한 것으로 추측된다. 이렇게 고온에서 열처리하 고 Cu 비가 높을 때 효율은 더 낮아졌다. 그러므로 태양전지의 성능 향상을 위해서는 200 C와 같은 낮은 온도에서의 열처리가 필요하다. Acknowledgments Fig. 10. Dark J-V curve of unannealed and 200 C- sulfurized CIGSe 2 solar cells This work was supported by the Center for Inorganic Photovoltaic Materials (No ). References Fig. 11. PL curve of unannealed and 200 C-sulfurized CIGSe 2 solar cells 밴드갭이 더 큰 sulfide가 존재하기 때문이다 8). Fig. 11은 열처리 전후 CIGSe 2 박막의 PL peak의 세기를 보여 준다. 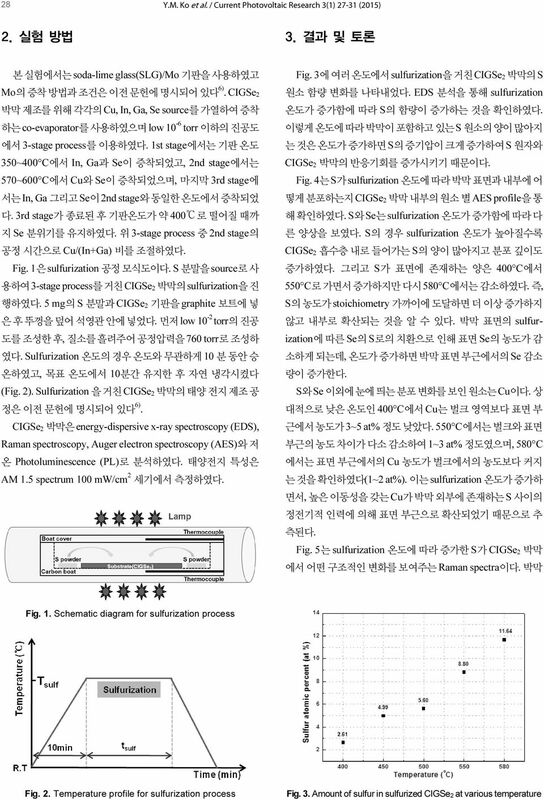 200 C에서 sulfurization한 후 shallow level emission peak 의 세기가 크게 증가하였다. 이는 박막 내에 존재하는 non radiative defect complex가 감소했기 때문이다. 따라서 효과적인 sulfurization은 200 C와 같이 저온에서 해야 함을 알 수 있었다. 4. 결 론 본 논문에서는 온도와 Cu/(In+Ga) 비가 각각 CIGSe 2 박막의 sulfurization에 미치는 영향에 대한 연구가 수행되었다. 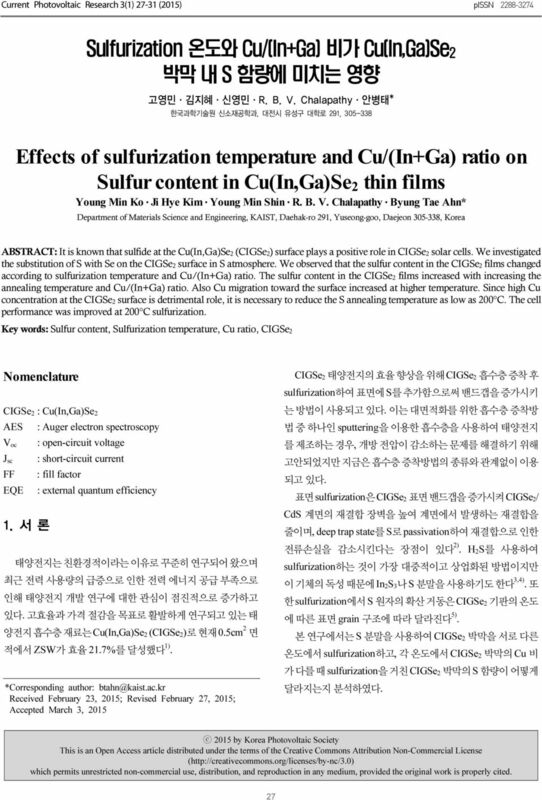 Sulfurization 온도가 증가할수록 CIGSe 2 박막 내 S의 양이 증가하 는 것을 확인하였다. 이는 sulfurization 온도 상승에 의한 S의 증 기압 증가에 따른 S와 CIGSe 2 박막 표면과의 반응 기회 증가에 의한 것으로 생각된다. 또한 CIGSe 2 박막 내 Cu/(In+Ga) 비 의 증가에 의해서도 sulfurization 후 박막 내 S의 양이 증가하는 것 을 관찰하였다. 이는 이동성이 좋고 양전하를 띠는 Cu와 음전하 1. M. A. 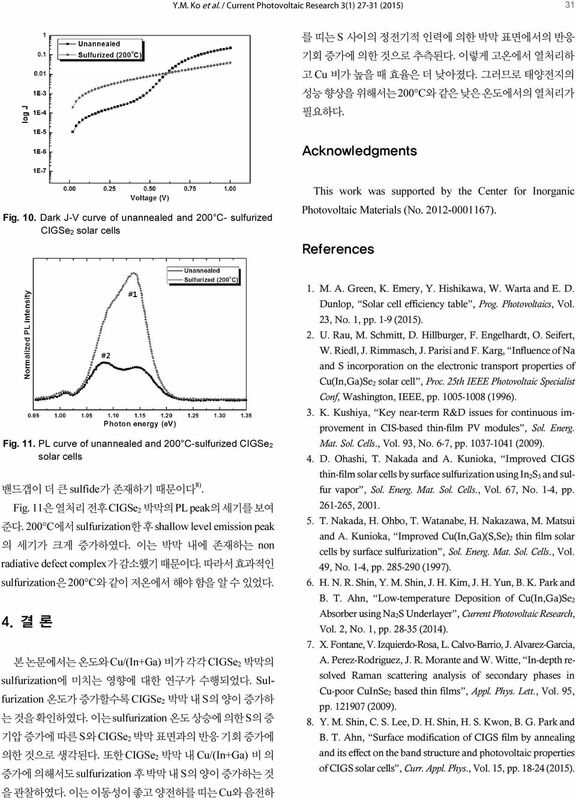 Green, K. Emery, Y. Hishikawa, W. Warta and E. D. Dunlop, Solar cell efficiency table, Prog. Photovoltaics, Vol. 23, No. 1, pp. 1-9 (2015). 2. U. Rau, M. Schmitt, D. Hillburger, F. Engelhardt, O. Seifert, W. Riedl, J. Rimmasch, J. Parisi and F. Karg, Influence of Na and S incorporation on the electronic transport properties of Cu(In,Ga)Se 2 solar cell, Proc. 25th IEEE Photovoltaic Specialist Conf, Washington, IEEE, pp (1996). 3. K. Kushiya, Key near-term R&D issues for continuous improvement in CIS-based thin-film PV modules, Sol. Energ. Mat. Sol. Cells., Vol. 93, No. 6-7, pp (2009). 4. D. Ohashi, T. Nakada and A. Kunioka, Improved CIGS thin-film solar cells by surface sulfurization using In 2S 3 and sulfur vapor, Sol. Energ. Mat. Sol. Cells., Vol. 67, No. 1-4, pp , T. Nakada, H. Ohbo, T. Watanabe, H. Nakazawa, M. Matsui and A. Kunioka, Improved Cu(In,Ga)(S,Se) 2 thin film solar cells by surface sulfurization, Sol. Energ. Mat. Sol. Cells., Vol. 49, No. 1-4, pp (1997). 6. 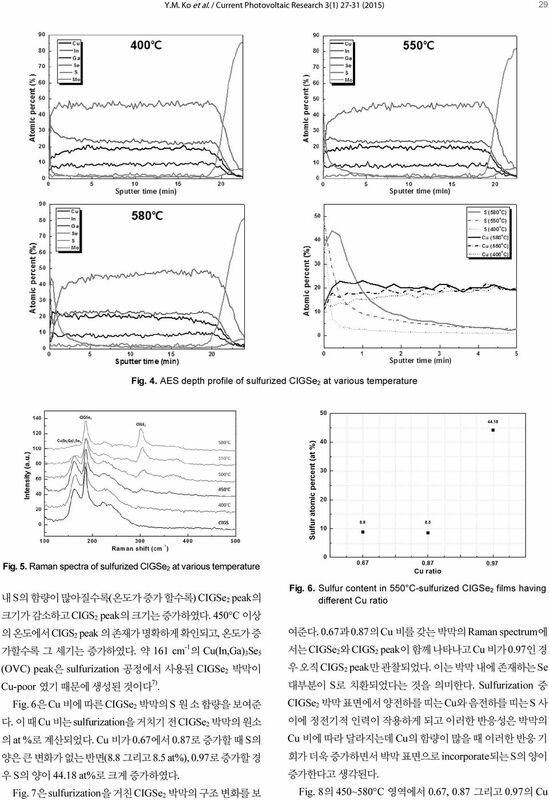 H. N. R. Shin, Y. M. Shin, J. H. Kim, J. H. Yun, B. K. Park and B. T. Ahn, Low-temperature Deposition of Cu(In,Ga)Se 2 Absorber using Na 2S Underlayer, Current Photovoltaic Research, Vol. 2, No. 1, pp (2014). 7. X. Fontane, V. Izquierdo-Rosa, L. Calvo-Barrio, J. Alvarez-Garcia, A. Perez-Rodriguez, J. R. Morante and W. Witte, In-depth resolved Raman scattering analysis of secondary phases in Cu-poor CuInSe 2 based thin films, Appl. Phys. Lett., Vol. 95, pp (2009). 8. 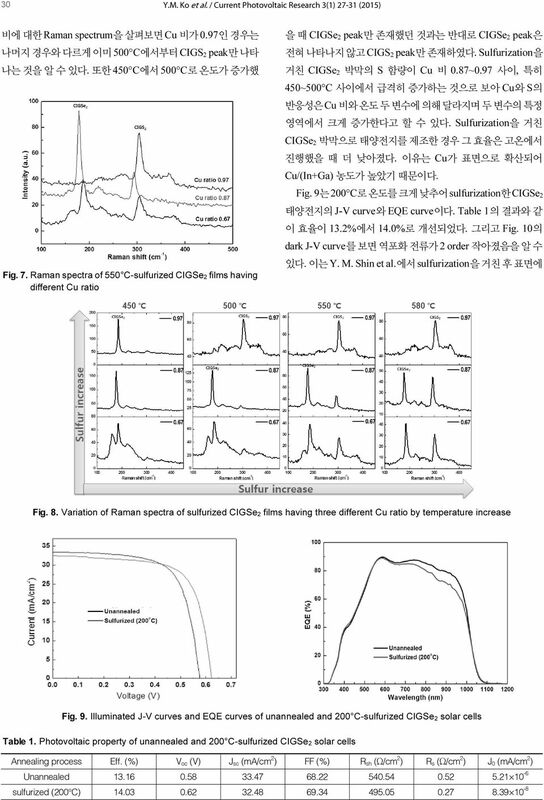 Y. M. Shin, C. S. Lee, D. H. Shin, H. S. Kwon, B. G. Park and B. T. Ahn, Surface modification of CIGS film by annealing and its effect on the band structure and photovoltaic properties of CIGS solar cells, Curr. Appl. Phys., Vol. 15, pp (2015).